What do teens do with their phones? A majority of teens exchange texts daily with others, and half exchange texts daily specifically with their friends. Fully 63% of all teens say they exchange text messages every day with people in their lives. Just 1% of teens say they text less than once a week, and 26% of respondents (including those without cell phones) said they do not text with other people at all. When specifically asked about texting with friends, 49% of teens send and receive text messages with friends every day – while 28% of all teens say they never text friends. Overall, the number of teens who text daily with friends has remained flat over the past two years. 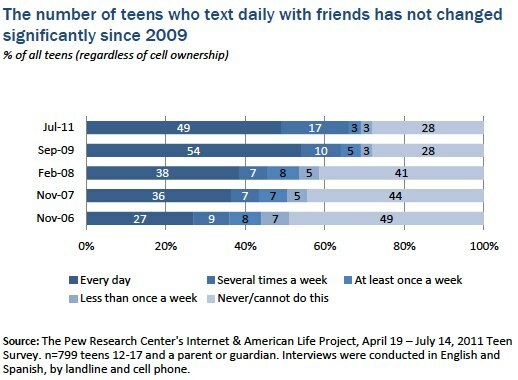 In 2009, 54% of all teens (regardless of whether they owned a cell phone) texted with friends daily. 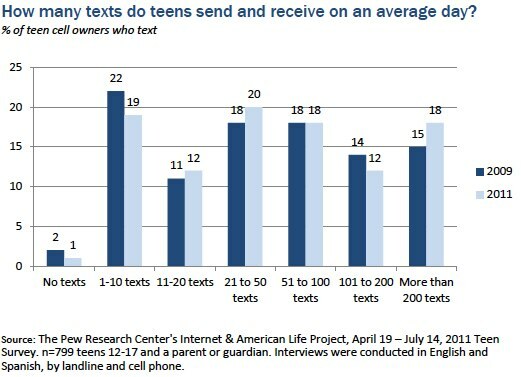 This is a statistically insignificant difference with the 49% of all teens who text with friends every day in 2011. Teens are still sending large numbers of texts, and daily averages are moving upward. The typical American teen is sending and receiving a greater number of texts than they were in 2009; and teens who text the largest number of messages are texting even more messages on a typical day than they did two years ago. The median number of texts (i.e. the midpoint user in our sample) sent on a typical day by teens ages 12-17 rose from 50 in 2009 to 60 in 2011. Much of this increase occurred among older teens 14-17, who went from a median of 60 texts a day to a median of 100 two years later. Boys also had a slightly larger increase in the median number of texts sent or received each day moving from 30 texts to 50 texts on a typical day. Older girls remain the most enthusiastic texters, with a median of 100 texts a day in 2011, compared with 50 for boys the same age. We divide text message users into three camps: light messagers who send and receive somewhere from 0 to 20 messages on a typical day; medium messagers who send and receive 21-to 100 texts a day and heavy texters who send and receive more than 100 texts a day. Heavy texters talk more frequently on their phones than lighter texters. Heavy texters are also big talkers. Heavy texters are much more likely than those who text less often to say that they talk on their cell phone daily, with 69% of heavy texters talking daily on their cell phones, compared with 46% of medium and 43% of light texters. When it comes to speaking with friends, the difference between heavy texters and others extends to landlines as well as mobile phones. Nearly a third (30%) of heavy texters talk with friends on a landline every day, while just 8% and 10% of medium and light texters do so. Similarly, more than half (52%) of heavy texters talk daily on their cell phones with friends, while 29% of medium texters and 22% of light texters talk to friends that frequently on their cell phones. Heavy texters are also more likely to report spending time with people in person outside of school on a daily basis than lighter texters – half (52%) of heavy texters spend time with people in person daily, while just a third (30% and 32%) of medium and light texters say the same, respectively. Heavy and medium texters are also more likely than light texters to use an online social network site. Nine in ten (92% of heavy and 89% of medium) of these texters use these sites, compared with 68% of light texters. Teens who text more than 20 texts a day are more likely to own a smartphone. Heavy and medium texters are more likely to report owning a smartphone than those who text less often. Fully 2 in 5 heavy texters (41%) and a third (33%) of medium texters own a smartphone, compared with just under 1 in 5 (19%) of lighter texters. Light texters are more likely to say that they own a regular mobile phone than those who text more often, with 70% of light texters with a regular phone, compared with half of heavy and medium texters. Heavy texters and medium texters are also more likely to report going online via a mobile phone in the last 30 days than light texters – potentially related to their greater ownership of smartphones. There are no differences in the likelihood of a texter going online on a desktop or laptop, a game console or an Mp3 player by the number of texts sent and received each day. Among texting teens who do not own a computer, heavy texters are the least likely to have any computer access at home. Overall, teens who text have relatively equal access to computers – approximately three quarters of each group says they own a desktop or laptop computer. But when digging into the 26% of teens who say they do not own a desktop or laptop – a far greater percentage of the heavy texters in this non-owning group report that they do not have any access to any computer at home, even one owned by someone else in the household. Nearly half of the heavy texters in this computerless group do not have computer access at home at all, while just a bit more than one-fifth of medium and light texters who do not personally own a computer say they lack home computer access. Nearly 2 in 5 (39%) of all teens talk to people they know on a cell phone every day, though 25% of teens say they cannot or do not ever talk on a cell phone. Landlines do not show the same kind of all-purpose utility, however – just under 1 in 5 (19%) of teens say they talk to people daily on a landline phone – while a similar 20% say they never talk to someone on a landline (or cannot do so). However, when looking more specifically at talking with friends by voice calls, we see evidence of a decline in the frequency of voice calling for these conversations with friends. 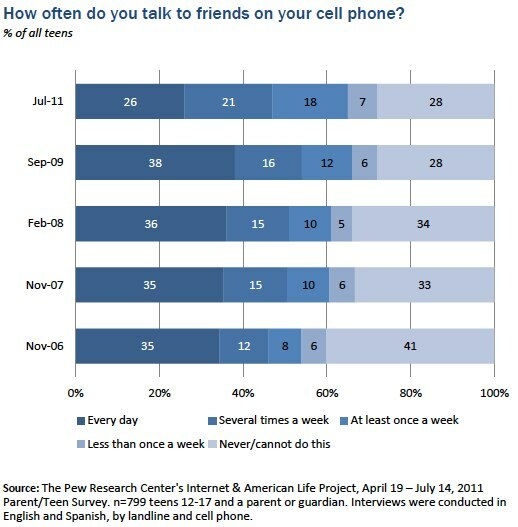 Just 14% of teens say they talk daily with friends on a landline, down from a full 30% in 2009. 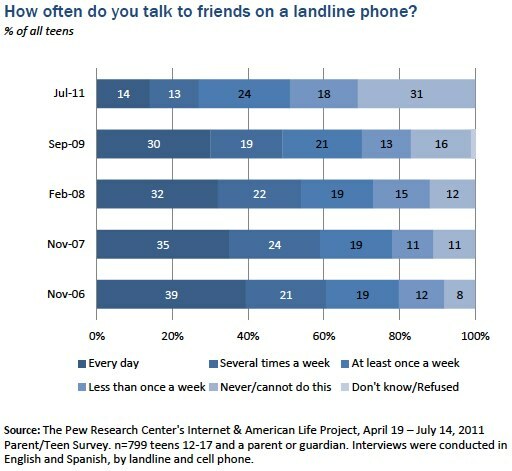 Nearly a third (31%) of teens say they never talk on a landline with friends (or report that they cannot do so). Cell phone calling to friends shows a similar decline – 26% of all teens (including those with and without cell phones) say they talk daily with friends on their cell phone, down from 38% of teens in 2009. Location-based services are applications (like Foursquare or Gowalla) or features on platforms (like Facebook or Twitter) that let a user “check in” to a location or share their location with friends. The question we asked on our survey focused on cell phone-based use of location-based services, and was asked of cell phone owners. 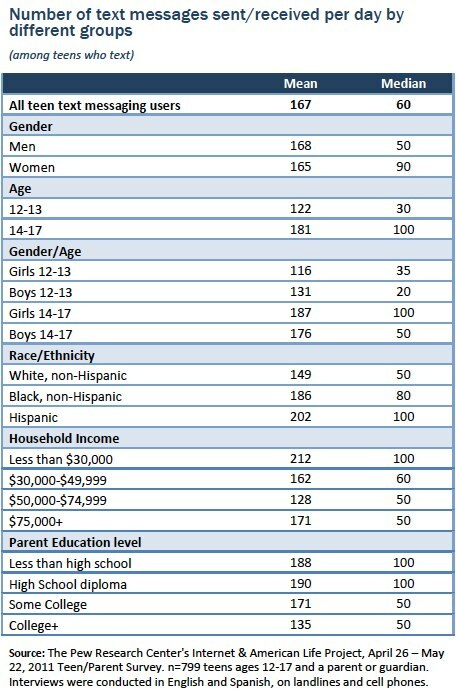 Overall, 6% of all American teens use location-based services on their cell phones. When focusing solely on cell phone users, fully 8% of teen cell users have used such a service on their cell phone to check in or share their location. Smartphone owners are more avid users – 18% of smartphone owners in the sample had shared their location, compared with 2% of all other teens. 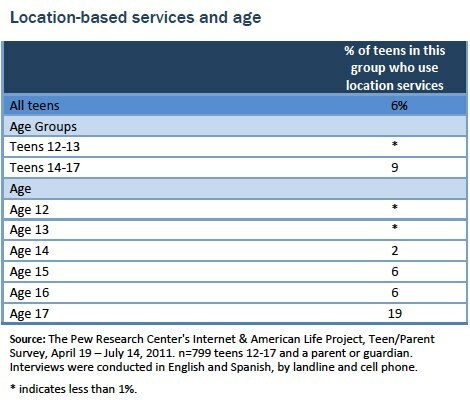 Older teens ages 14 to 17 are more likely to use location-based services (9%) than 12 and 13-year-olds, of whom less than 1% report using a location-based service. Indeed, in our sample the largest group of teens who broadcast their location are 17-year-olds, of whom 19% reported using these services, compared with 6% of 15 and 16-year-olds. There are no statistically significant differences in use of location-based services by gender, race, household income, or parent’s education level. There also appears to be a relationship between sharing one’s location and sharing other information with others. Teens who use location-based services are also more likely to have ever shared a password with a friend or significant other than teens who do not use the services (11% vs. 4%).